What about the Other Queens? By anthropomorphizing game tokens, Carroll turns the two Queens of a chessboard into whimsical plot devices that help move Alice along her journey. These characters also encourage/guide Alice toward change, since, in the story, Alice progresses from the position of pawn to that of Queen. In all the portrayals of the story, the Queen of Hearts rules her part of Wonderland and has full authority over ALL the other cards in the deck. If she is the Queen of Hearts, shouldn’t her card soldiers be ONLY heart cards instead of a mix of all four suits? Furthermore, where are the other Queens? With her penchant for emotional rage and decapitation, one could presume that the Queen of Hearts took control over Wonderland and simply eliminated her competition. 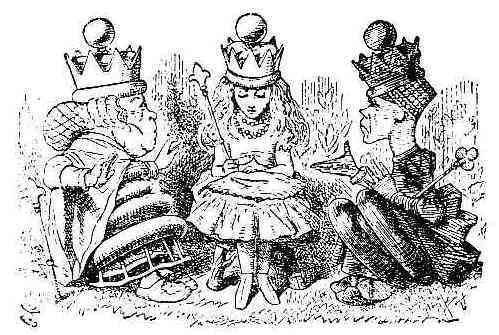 In terms of story construction, with all the other fantastical characters that Alice meets, there really wasn’t need or room for the other three Queens. 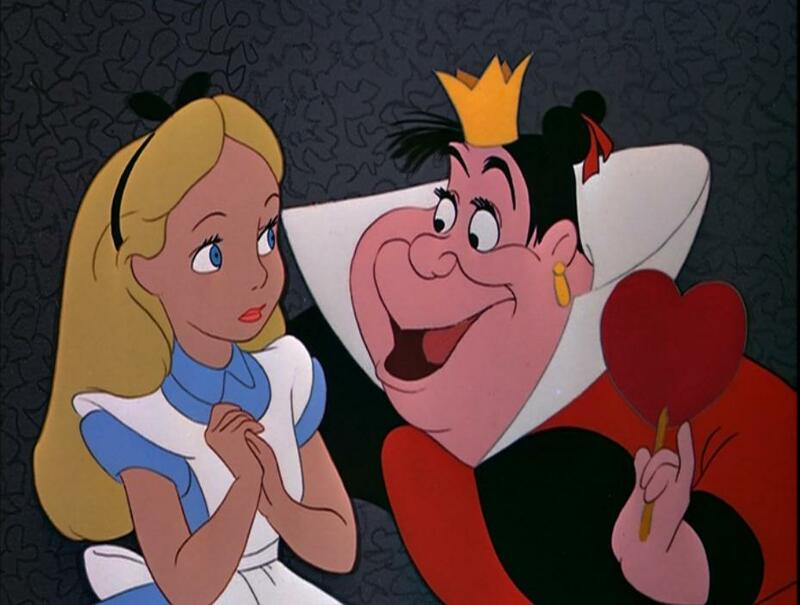 In the story, the Queen of Hearts serves as little more than a semi-antagonistic side character who chides and belittles Alice to push her into some form of action. If the other Queens did exist in Wonderland at some point, however, what would they have been like? To answer this question, we first must understand the symbology of the Queen cards for each suit. Afterwards, we will need to examine how Carroll created the obscure Wonderland lens to transform the traditional version of the Queen of Hearts into the insane fictional villain we’ve all come to know so well. In a mystical sense, playing cards are simply a different version of tarot cards. Each card and each suit represents a different aspect of life in both the material and spiritual worlds. The images on tarot cards generally represent obstacles we face in both plains of existence. Metasymbology.com states that the French were among the first to create the modern version of the suits that we now know, (hearts, clubs, diamonds, and spades). In tarot, however, the four corresponding suits are cups, wands, pentacles, and swords. 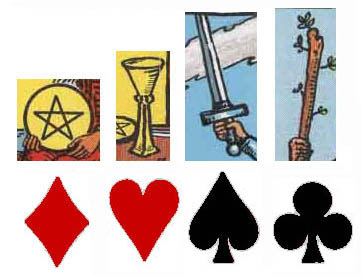 Just like in tarot, the four modern suits are connected to the four elements: fire (heart); air (clubs); earth (diamonds); and, water (spades). Regardless of suit, the Queen is generally linked to spirituality, intuition, and the divine. This interpretation of symbolism dates back to medieval literature where, more often than not, female characters, especially ones with authority, such as Queens, were deemed responsible for guiding people toward spirituality, decency, and God. Of course, there are two sides of the coin here. Typically, within medieval literature, a high percentage of female characters were designed as archetypes that fell into one extreme or the other: either the virtuous saint or the whore of Babylon. Perhaps this cookie-cutter binary interpretation of symbols influenced Carroll’s recreation of the Queen of Hearts. He uses the lens of Wonderland to create a version of reality that is, in many ways, opposite to the logic of our reality. Nevertheless, instead of simply flipping the binary, where the saint is evil and the whore virtuous, Carroll instead shows these perceived virtues pushed to the point of madness and beyond. As an example, according to mysticism, the Queen of Hearts is fueled by fire associated with love, passion, and emotions. She judges the world based on how people live up to the principles of love, including passionate-physical love, patriotic love, familial love, and homo-social love. Romantics view love as a form of endurance and a willingness to sacrifice, but these are idealistic fantasies. Carroll may have recognized this level of idealism as well, which could explain why he focuses on the irrational nature of emotions for his version of the Queen. By using a system of judgment based on the extremes of idealistic love, Carroll demonstrates how such a system proves unfair and fickle. Carroll highlights his point by having the famous trial scene go in reverse-order. During the same scene, the only evidence used has no relevance to the case. 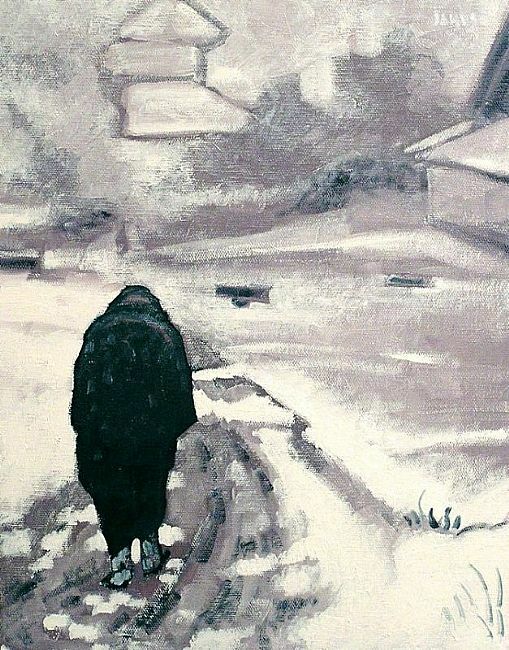 Carroll’s examples show that while love may be beautiful artistically, the emotions associated with love often cause a whirlwind of pain, torment, and temporary insanity. Although there is no evidence that Carroll even considered the characters of the other three queens, I would like to sketch out how their characters might have been portrayed in Wonderland. Mysticism associates this suit with the element of air, a free-flowing element that travels all around, gathering speed and information on its way. Ruled by logic, the Queen of Clubs represents a pragmatic approach to life. In Wonderland, extreme pragmatism may have led to an abhorrence of all things emotional and irrational. The Queen of Clubs might have become so obsessed with her need for order that she would’ve torn Wonderland apart and rebuild it in her own image: a world of logic and limits – sound familiar? No doubt that the Queen of Clubs and the Queen of Hearts would have been bitter rivals. 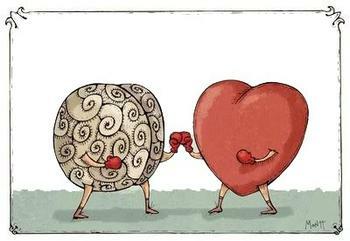 As complete opposites, they surely would have attempted to destroy each other. The Queen of Hearts would have labeled the Queen of Clubs as a destroyer of love, which would’ve motivated her to attack immediately. However, the Queen of Clubs’ extreme pragmatism would have pushed her to create alliances with one or more of the other Queens before destroying the Queen of Hearts. The suit of diamonds is linked to the element of earth, denoting an attachment to worldly cares and possessions. Within our world, the Queen of Diamonds uses a system of social values to make moral judgments and criticisms. In Wonderland, on the other hand, with mad people around every corner, a social system of values would involve an ever-changing system based on the whims of the day. In many ways, the Queen of Diamonds would thus appear schizophrenic. From a writer’s perspective, this interpretation would point out how societal values change so frequently mainly to accommodate the social classes or to excuse certain social ills. Due to her ever-changing value system, and a multiple-personality disorder, the Queen of Diamonds would probably have aligned herself with both the Queen of Clubs and the Queen of Hearts, although no one, not even the Queen of Diamonds herself, would know about the double allegiances. Therefore, some of her armies would attack the Heart forces while the rest of her armies attacked the Club forces. They would kill their own men in these insane skirmishes, and they would completely ignore any rules of engagement, if such rules even exist in Wonderland. As the final suit, spades are tied to the element of water. This element represents fluidity, free movement, and the acceptance of all things in life and in death. The Queen of Spades uses her age, her experience, and her willingness to accept all things to make her judgments on the world. She is denoted as wise and sagely. The dark lens of Wonderland, however, could transform this wise woman into an apathetic person who cares little for the world we live in, since all things grow and decay. Instead of ruling her kingdom, she would most likely wander around like some form of mystic or hermit who cannot be bothered to care for the ways the world. Thus, in the wars between Queens, she probably would have had nothing to do with them. In fact, without a ruler, her armies would have broken apart into chaos and her soldiers probably would have become mercenaries hired by the other Queens. The Queen of Spades may still exist and wander around Wonderland. The other Queens would not have bothered with her, since she posed no threat to their victories. Like all things, though, she too will wither away eventually, and for the time being she’s just waiting for that final day to come.